I texted Giancarlo for a quote and received a reply within minutes. The next day he showed up to provide me an estimate. He listened to what my requirement/needs were and gave me options for what I wanted. At no time did he pressure me into hiring his company or tried to get me to purchase something more expensive. He would have started approx. 1 week later but I had to delay the job. There was an issue with the location of my water drainage pipe. Giancarlo gave me two options for how they could deal with it. He ended up doing the option he did not recommend because it was what I had wanted. I can not say enough good things about this company. Everything I asked for was delivered plus some. 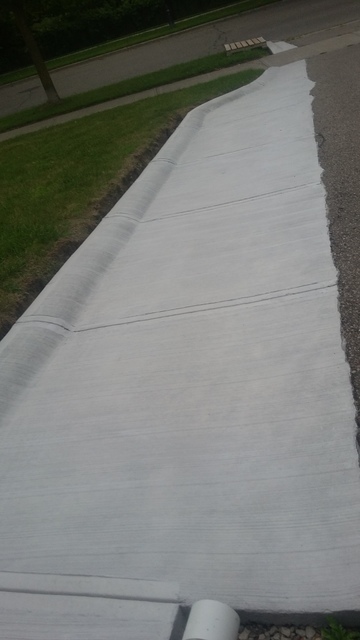 They ensured the concrete was level with my grass (for safety issues) , ensured it was level with the sidewalk so snowplows would not hit it. The colour and design turned out much better then I had imagined. All the employees were professional and courtesy. They cleaned up absolutely everything. My only complaint was if I had known how much I was going to love it, I would have made it larger. Thank you Giancarlo. P.S. I attached a photo but the photo does not do it justice. OMG Julie you were truly amazing to work for ! Not only did you make it so easy to work with, but I would recommend anyone to do work for you ..